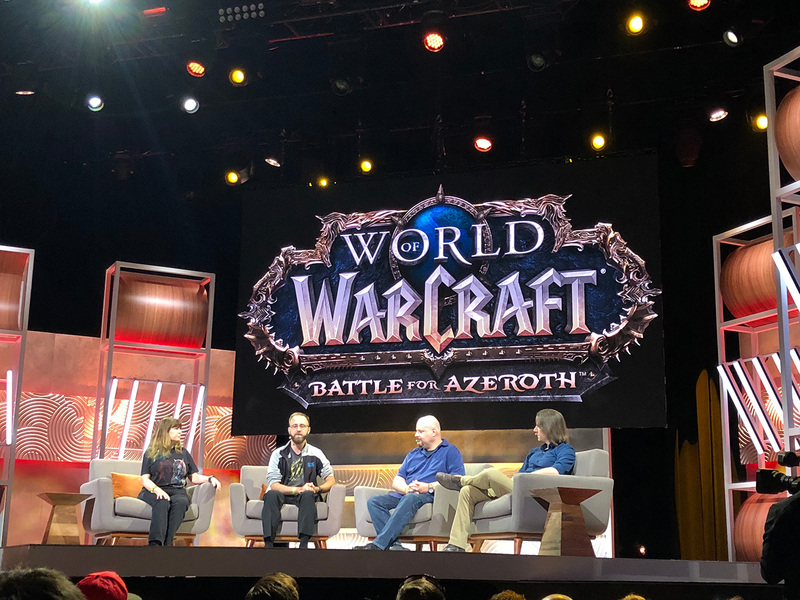 Danny Perschonok attended the E3 2018 World of Warcraft Storytelling panel by Christie Golden, Terran Gregory, and Steve Danuser. The panel didn’t go deep into what we should expect post-launch, but it let us glimpse a bit into the process of storytelling, which is not simply done by Christie or Terran as an individual. There is a whole team of over twenty quest design developers and about 15 story development writers who chime in, share ideas, and the combination of those ideas and group decisions shapes the story. There are two nuggets of info that came out of the panel. Someone (or plural) is going to die in this expansion, and as mentioned by Daniel Stahl at PAX East 2018, something our way is coming soon before launch. 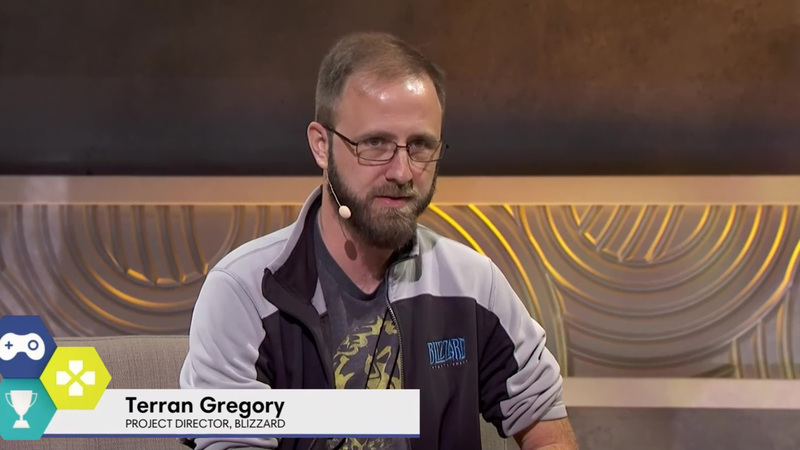 According to Terran Gregory, there is some stuff coming soon that Blizzard hasn’t done before. So, really, to hear that something is coming that Blizzard hasn’t done before is exciting, and enigmatic. Could you even make a decent guess? There is actually something Blizzard did recently in Heroes of the Storm that might qualify as something never done in World of Warcraft. If you watch the Heroes of the Storm Mecha Storm Trailer, you will quickly notice that it looks like a Robotech TV Cartoon. Imagine close up one-on-one combat, and full army combat scenes in the same vibe as Mecha Storm, and that would be awesome. Other than that, I can’t even fathom what could qualify as something Blizzard hasn’t done before for a World of Warcraft pre-launch crossmedia. We have a transcript of the panel in the works. Follow @Blizzplanetcom for an alert once that’s available. The panel VOD can be watched below. Announcer: Please, welcome Matthew Mercer, Steve Danuser, Terran Gregory, and Christie Golden. 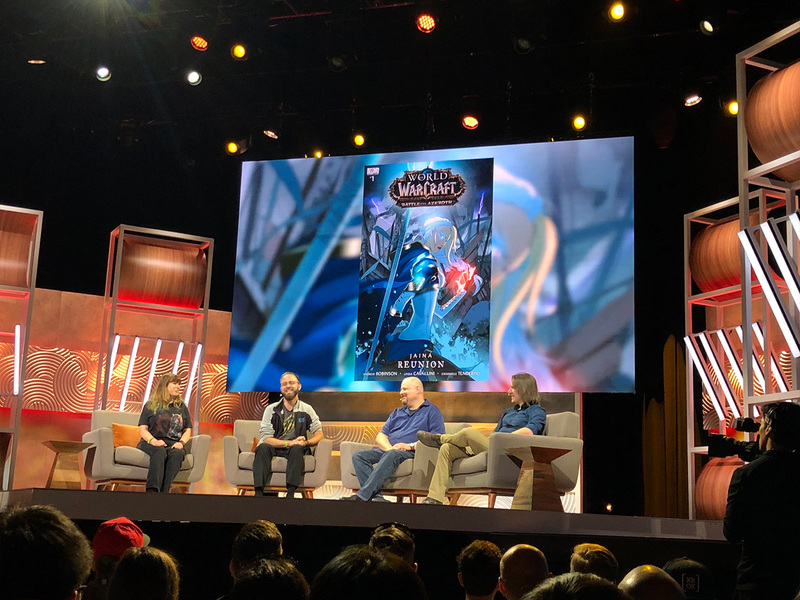 Moderator: Welcome everyone to a fantastic panel here discussing the storytelling and narrative of World of Warcraft, a game that has consumed my life wonderfully for many years, and I am sure of many of you as well. So before I jump into that, let me introduce this panel that I am very excited to introduce to you. Many faces you may have seen at BlizzCon. First, we’ll begin with the man who is responsible for a lot of the driving story of the game from now, past, and beyond. 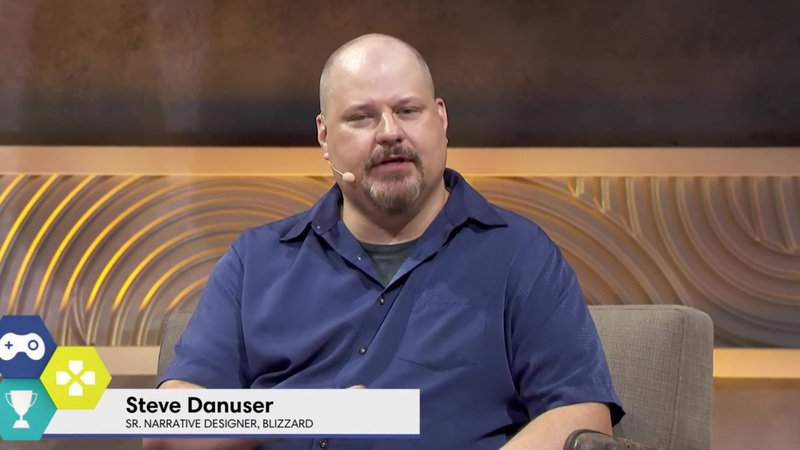 We have the senior narrative designer on World of Warcraft Steve Danuser. Steve: This is awesome. Such an honor to be here, thanks everybody for coming. Moderator: And then next to you (my friend)… We have the fantastic in-games cinematic director, the project director for World of Warcraft, jumping in to the fantastic reveal of Wrathgate back on the Lich King expansion hit and since, these have also drive the narrative focus of the game cinematically forward. We have Terran Gregory. 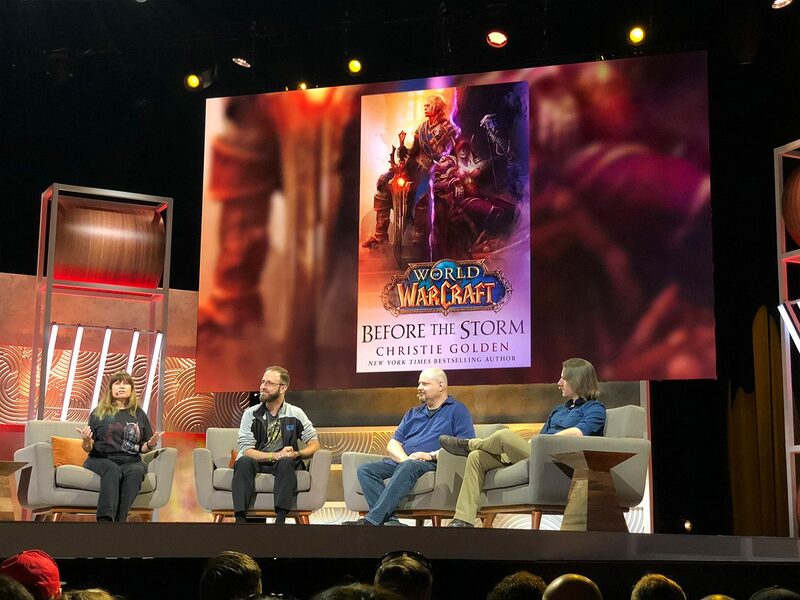 Moderator: And last, but definitely not the least, we have the extremely talented senior writer at Blizzard, and New York Times bestselling author responsible for 13 World of Warcraft novels since the year 2000… the fantastic Christie Golden. So between the three of you guys, there is quite an expansive narrative that you alongside many of the people on your teams have been crafting over the years, I want to ask each one of you what is your responsibility, your focus responsibility on building this story. Steve: Yeah. So my piece is the in-game stuff. So I get to work with our phenomenal design team. We have a ton of quest designers, ton of other designers, and I take the dialogue, the quest text, make sure that our characters have consistent voice, that there is a continuity of story. 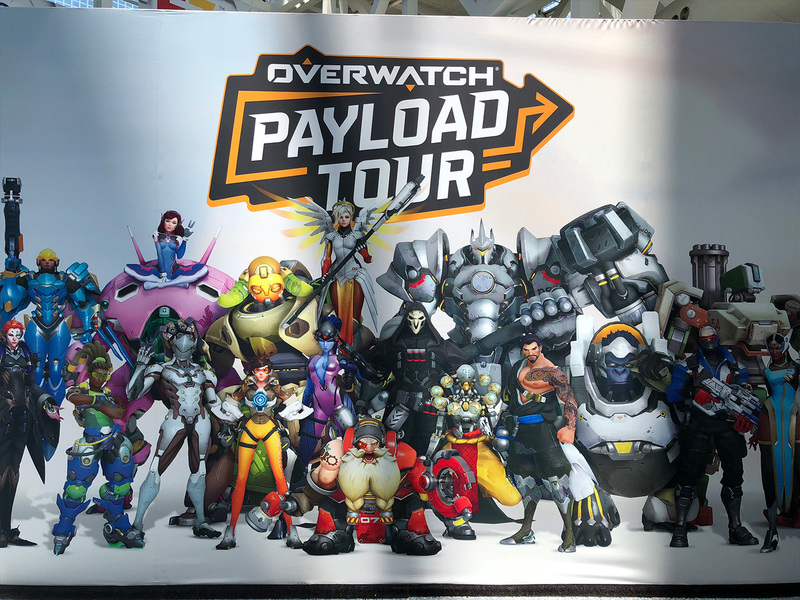 I work with our incredible VO team to go into sessions and record the voice over, and make sure that we did the performances that we needed for the game; and I get to work with these guys and talk about what we have going on in the game, and how they can help bring that to life through their specialties. So I have the ultimate nerd dream job, really. Moderator: (Laughs) pretty much, not so bad. Moderator: You, Terran. What do you bring to the table, my friend? Terran: Well, I have been directing in-game cinematics in World of Warcraft for about 12 years now. As Matt mentioned, starting with the Wrathgate, and every expansion since. I work with a team of other directors. There are many of us really… Cinematic directors at Blizzard Entertainment, and the Blizzard animation division, and we’ve really branched out over the last few years with different storytelling mediums: from the pre-rendered cinematic that we developed, to the in-game cinematics that go into the game as well as the 2.5D motion graphic pieces you may have seen for Warlords of Draenor, and for Legion; and each one of those is a different division within our story and franchise development, and all of those are created lovingly by our team with the best effort of supporting and enforcing the Warcraft narrative, and pushing our characters forward. Moderator: Wonderful. And then over next to you we have Christie. You’ve been with this project extremely long as well. Development team get from the book and narrative standpoint from the written format. What has been the most interesting element of that responsibly and how has it been working with these teams to help craft that world? 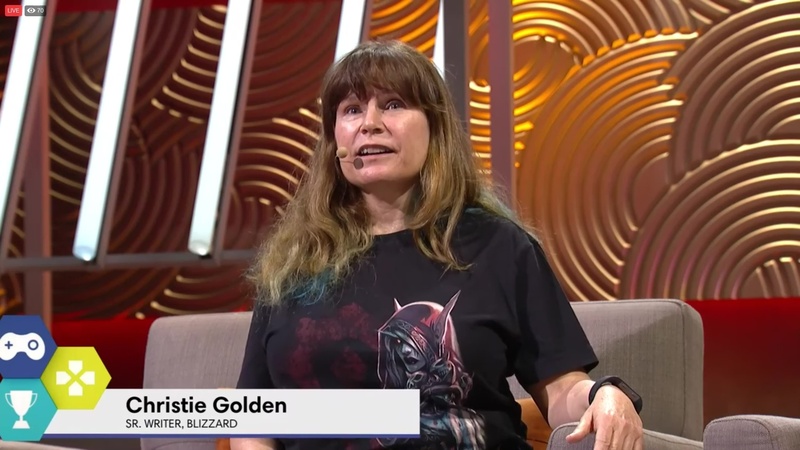 Christie: Well, I came in before there was even a World of Warcraft, and so I got a chance to create some of the characters in that they were established, but I got to flesh them out, get inside their heads, help grow their story a little bit in conjunction always very closely with Blizzard. So I’ve really gotten to get inside the heads of so many characters over the years, and coming here, being able to bring just all that knowledge and then work with people like Terran. By the way, Terran and I have a standing meeting every single day, and it is always so much fun. One of our producers came by and said: “You guys look like you’re having a really good time.” — and we are. So I am now able to branch out a little bit and do comics, song lyrics.. you may recall Mr. Mercer over here performing Kobolds and Catacombs. I co-wrote the lyrics for that. So that was very exciting. Moderator: Terran told me that recently, and I was super excited to find out. Christie: So I have my fingers in many places now, and it’s a lot of fun. Moderator: Heck yea. Now on that regard this is a cross medium way of telling the story as it continues to progress and develop. Aside from your standing meeting, what is it like having to take all this disparate elements together and make sure that it’s one consistent uniform story? Like… that sounds like a very (laughs) herculian effort. I imagine you probably suffer quite a bit at the thought of that. Steve: Well, it’s a huge team effort, it takes a lot of people, and it takes everybody’s passion and commitment, because if there is anybody who didn’t care, who didnt put a 100% into it, it wouldn’t work. But we’ve got a phenomenal team across the company of people doing that. We love telling stories, we love weaving this from the game into other mediums, and I think we spend a lot of time (especially in the recent expansion) trying to say rather than having an expansion like Burning Crusade that kind of tells a self-contained story, how do we weave this from one into the next; and we do that through the other medium that come out in between this big expansions and our patch content. Especially for legion, it has gotten a lot more on a regular cadence, a lot of more depth and involvement, so it’s a lot of fun. Moderator: I was about to say like with every progressive expansion in recent years, the focus of– the consequences of what the decisions in these stories are have become more intense. For those who haven’t played World of Warcraft in a while… may have stepped away… I don’t think you realize how much has changed in recent years beyond scaring the surface of the actual planet Azeroth and Cataclysm, in recent years with the Legion, going off world. Steve: Yeah, and if you haven’t been to Silithus lately, there has been some modifications, yeah we get the world stabbed by a giant sword, we’ve gone to the seat of the Pantheon, and seen the Titans — these legendary figures that shape the universe. The story has really gotten super cosmic, and yet it has got all these characters that make it really relatable on a human level, because at the end of the day whether you’re an elf, a dwarf or a gnome, or whatever it’s still the human connection that we need to get across. So I’m grateful for folks like these that really help us connect on that human level. Terran: You know stabbing the planet with a sword was not quite as hard as killing the alliance king (laughs) everyone is a little better. (ARrrghh!) Every one of these stories comes up and it’s like oh we’re going to do something utterly terribly brutal. I am both terrified and really excited as storyteller to dive deep in that story and see what we can tell in the most effective way possible. But in the instance of– like yeah, if anyone have turned out of the game, you now hasn’t been back to Azeroth for a while, when we were working on the cinematic for “Sargeras manifests and stabs a sword into the planet,” it was kind of one of the most conceptually mega things that I think we’re all sitting around going: “are we really doing this?” (laughs) Yea. We’re going to go to eleven on that one. 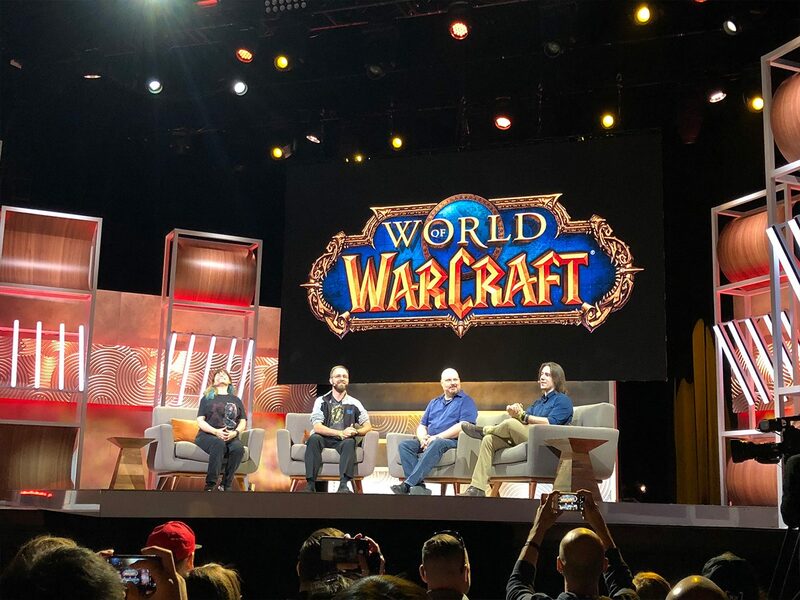 Definitely, some amazing events have happened and more amazing events are lined up in the near future for world Warcraft. Moderator: Yeah, you’ll see soon enough. And to a degree too, when you are playing the game, you’re playing as your own character, you’re immersed in the world, but you are definitely kind of watching and interacting with this large stories and these major lore characters. Christie you had the opportunity through these books over many years of giving the people who play or love the Warcraft universe the chance to see through the eyes of these characters, and really kind of show what makes them tick and what their mindset is in a first-person perspective. What is it like having to develop that with the team and the excitement of being able to tell these internal stories in perspective in a world where otherwise the players wouldn’t have the opportunity? Christie: When you are doing media tie-in work, it’s always with the team, first of all. You’re never just sitting in the room coming up with these things by yourself. You’re always touching base and stuff; and I really enjoy that aspect. So for me, it’s been pretty easy to move into the situation where I am part of the team and I had meetings, and I check in with people and we share communication. Somebody has always got your back. I work with the best people. I really really do. So that’s always really exciting; and I am actually theater-trained, so I kind of play the role when I am writing, and I kind of get into the characters’ head that way, and it’s very rewarding getting feedback from people. And we do try to acknowledge, where we can, anything that the player has done or make it nod to something that happened, you know a wanderer approached him and had given him some piece of advice or something; and people really like that because they are part of it. As you say, they are helping co-create as they play. So it’s pretty neat. Steve: We have a weekly meeting where we go over some of the cinematic groups for things that are upcoming, and these guys love to dig in. I think they have tried to one-up each other. Everybody goes: “yargh, I am more of an orc than you!” It’s a lot of fun. It’s true. Moderator: A little playful competition never hurt… yet. Moderator: But playing off that, kind of when we were talking about making the player feel more immersed in the story, I have played many MMOs through the years, believe it or not I am an indoor kid, very heavily; and what I’ve really loved is from the players’ standpoint, you guys have done a really good job of not just having them be a bystandard of the story, not just being a faceless individual as part of a nearby army that help accomplish a goal. You’ve built a narrative where the player becomes progressively more important, and is directly interacting with these very important story characters. That, to me, has been a really cool focus; and how interesting is that been in developing that (and I mean tease us) where they might be going? Steve: Well, I mean that is the center of what we do at Blizzard, like it says right on one our statues, one of our core values is about gameplay, and so we love story, we care about story, and we want the players to be the driving forces in the in-game story. So it’s the things you do, the ways that you interact with these big iconic heroes and stuff, that really does shape the world; and so it’s really cool that in some our more recent cinematics now we have the tech ability to work the player into the cinematics. So you get to see your own character standing there, and it’s like: “Hey, I am there as Aggramar is coming to smash me” or like: “I am the one standing up to him;” and so to keep the player involve and always remind them that they are the drivers of these world. The World of Warcraft wouldn’t be what it is without them. So you’re literally part of the lore of the world. I think that’s really awesome. Terran: It was extraordinarily trippy… the flipping through content: The Battle of the Wrathgate, and it’s like this historical document talking about this, and it was like having the inside scoop to the rooms where those decisions were made– that wasn’t history, that was just (laughs) amazing cognitive dissonance on that, but it’s amazing to witness. Steve: She is very judgy about outfits and fashions. So keep that in mind. Moderator: Actually we might lose faction with Undercity if we’re not careful (laughs). 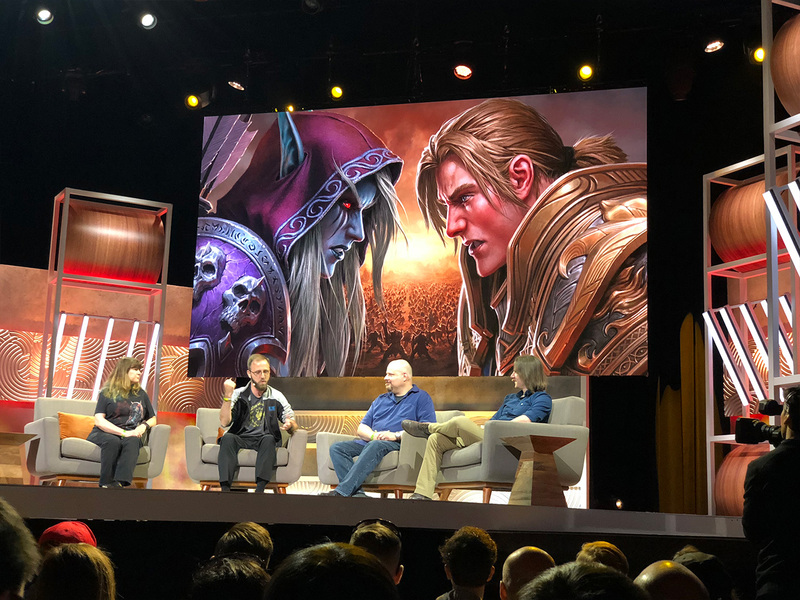 Speaking of faction, this expansion takes what has been the underline essence of World of Warcraft and really kind of brings it to an unprecedented level really emphasizing the actual faction war between the Horde and the Alliance. Can you talk a little bit about what you guys have been building towards and how you are planning to make this a different experience in underlaying that aspect of the game’s narrative? Terran: I think it’s always an interesting thing where it frequently comes up. The faction war has always been a part of World of Warcraft. Well, the faction conflict has always been a part of World of Warcraft from its earliest days. While the main storyline going on is usually some greater good/greater evil and we have our tussles between the Horde and the Alliance — where we are both working toward the same ultimate goal — I would wager to say this is actually the first time that all-out faction war has blown out between the Alliance and the Horde, and now the story has diverged completely into two opposing narratives; and that’s presented its own challenges in the execution of this, that we really love diving into. Steve: We really embrace that whole theme with this expansion. You know, it was red vs blue. This is Battles for Azeroth. It is right there in the name. In previous expansions, we face some big universal bad. Sargeras is coming. The Legion is here. All these things that kind of force unity, or at least force truces between these two sides. But that kind of resentment, those old hostilities, those are never forgotten. 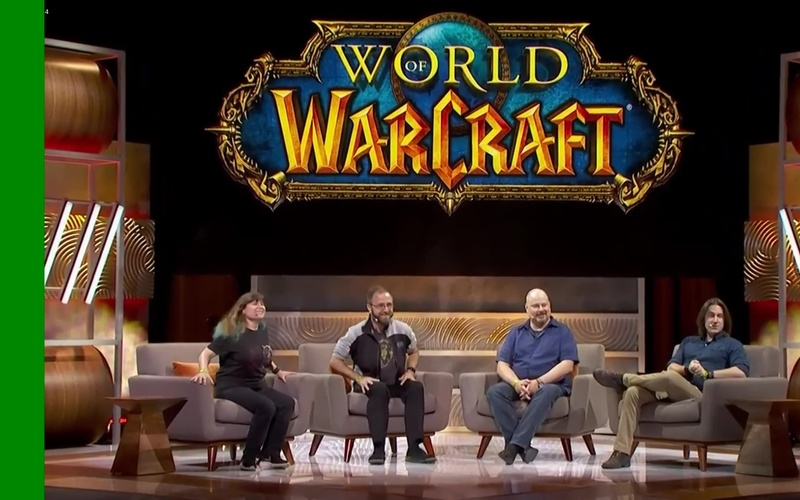 So now we really get the chance to have war at the forefront of the game, and that’s really exciting to the point where we have designed this whole expansion around the Horde players have their section, they are trying to recruit allies over here, the Alliance has their section, they are going to this continent to recruit allies; and then those forces would inevitably come into Conflict. So it’s really awesome. Christie: That’s actually one of the key story (?) 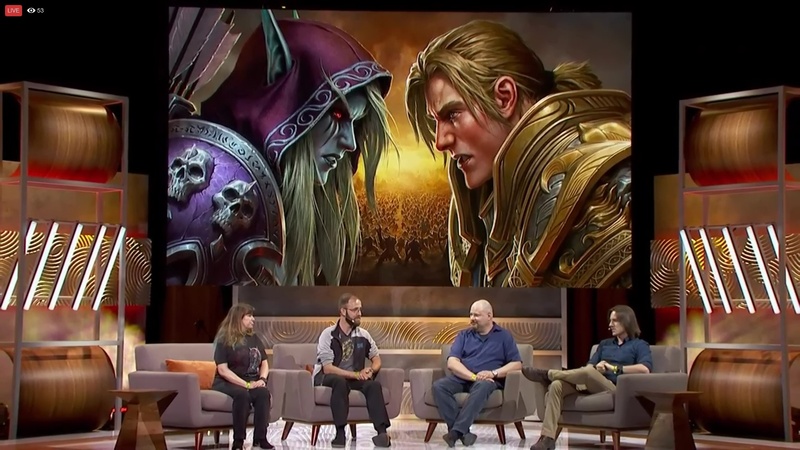 for Before the Storm was Blizzard approached me, and they told me what was going to be going on, and they said: “We really want to go deep into both Sylvanas and Anduin, and get into their heads, see what they think, see what they feel;” and so that’s really what I had in the back of my head when I was writing that… is this deep dive into the character. Christie: Well, I have been doing this for 27 years, and it never gets easy; but you know, I do understand this is the thing about working with a game that is even greater than other IPs, it is a game, it is really a living entity. It can change right up to the moment of shipping, there are patches that bring in new content all the time, and so you need to be prepared to keep up with the pace of it; and they are always looking for ways to make it more interesting, make it more gripping, bring people even firmer in; and that’s one of the ways to do it, and other ways is also introducing new characters, and that is great to do too. Steve: Decisions like that… like killing off a major character is never arbitrary. The way I look at it is when you have a really cohesive world, and you have this involved story with characters that feel real and relatable, the story kind of tells you where it needs to go in ways. Like it becomes inevitable that certain things happen, and if you don’t let those things happen, it’s almost like you’re not being true to the story that you’ve laid. You have to let these things play out, and sometimes you come to a realization, and you’re like: “oh my God this character that I love so much has to die for this thing to happen, for the world to evolve.” And it’s never easy. We don’t make those decisions lightly; but when it has to happen, it has to happen, and the death thing ain’t done yet. Terran: And then also sometimes chasing the truth of war, not everyone would have a heroic death, some deaths are tragic in the wrong right for being so out of nowhere, or he didn’t deserve that; and like… dude if we weren’t doing that occasionally, it wouldn’t be true to how war feels as a person. To have someone unjustly taken away from you. That’s part of the pallet of– our recreating these emotions in a verifiable sense. 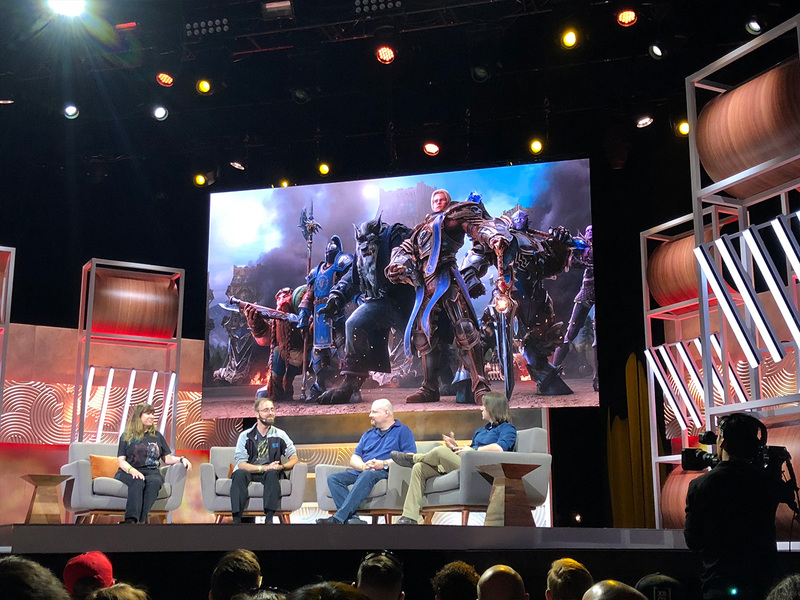 Moderator: I am really excited about the evolution towards these part of the narrative partially because it’s very easy to make a game experience or a storytelling experience where you have very clearly-defined boundaries between what’s good and what’s evil. You know the heroes are fighting something that is an ancient demonic entity that corrupted the cosmos, you pretty much know… ok… he’s a bad guy. We’ll beat him and feel good about our victory. We are now stepping into territory where we get to really play with those elements and what it means to be just different perspectives: what is good, what is bad. That morally grey between them, and having to make hard choices for your faction, for all the people you care for, and really see the consequences of the actions you take; and even just a little bit of what we’ve seen about the coming expansion… I am already seeing elements of that definitely we’re going to be playing at the forefront. Terran: I think my big take away before I came to Blizzard from the Warcraft series was the reason I fell in love with it. First, was that nothing was black and white. Nothing. It seemed like every character had some motivations behind the scenes. What you’d have expected this faction to be doing is not what they are doing and vice versa; and that always make me fall in love with, just like the potential involved there. So I wanted to carry that legacy forward. Christie: It’s a very rich world. It really is, and there is so much there to sauce out when you are working with it. I look at Legion, when the initial expansion launched, it was just the start of the story; and then over the patches, over the cinematics, over the different media that we wove in there, you kind of take a step back and look at the whole thing, and it is how this cohesive story ends; and that’s the same… that’s going to happen with Battle for Azeroth too. We are just dipping the toes and we’re kind of have this (?) board of stories right now, and different characters and narratives; but this this is a long term project, and it takes shape over the months and years to come. The little bits that you get of story now are going to blossom into a field of flowers. That’s really kind of what alpha testing is necessitating it’s like we have to test the mechanics, but people are only getting like one piece at a time whereas this narrative has been worked out with Christie, with Steve, and with dozens of other people on the World of Warcraft team responsible for the sub-narratives of the different zones and experiences like all many DMs and their own regard, their own territories; but we all try to collaborate to create one consistent narrative; but that’s all being constructed to be played and experienced from day one and that’s the only time you’re going to get the experience as it was intended to be delivered. Moderator: But on that degree, one thing you mentioned, these vast teams that you’re working with just to get an idea like how many people do you work with on your individual teams on a daily basis? 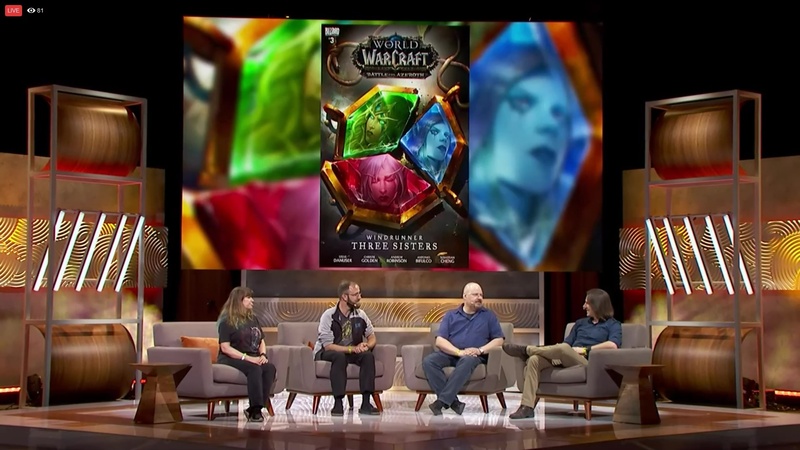 Steve: So we have 20-some quest designers and that’s just the quest part. We have a whole room full of encounters designers (who do dungeons and raids, and there are some story bits that happen there), we have system designers, class designers, we have artists, level designers. We have everybody. 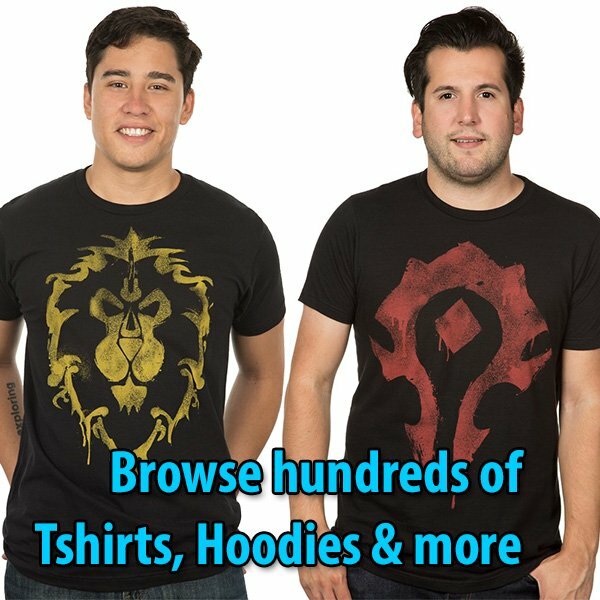 There is hundreds of people on the World of Warcraft team. That all come together. That all have to talk to one another in order to make that consistency, that continuity of a world come together. So on any day I am interacting with dozens of people and with the passion that drives all us to come together and make the best thing possible. Super inspiring. Terran: And on the story and franchise development side, our studio contains Blizzard Animations, or Blizzard Cinematics, and that group also includes the ones that are making the 2.5D motion graphics novels, the creative development, all that. Christie is speaking more of that. But I’d say we have a couple to hundred artists, but they work on all of Blizzards IPs — whether it’s an Overwatch cinematic, or a Heroes of the Storm cinematic. The same group is usually diverting to whichever needs the next thing. Whereas my group that I usually work with the in-game cinematics for WoW, it is kind of a smaller dedicated group of probably between 20 and 30 people that work on all of the in-game content for World of Warcraft. Christie: And I also work for story and franchise development, and I am on the subset of creative development — the writers group. There is only about 15 people that I work with, but every day I am at meetings with Steve, or with Alex, or with someone from Heroes of the Storm. So I work with all of the various games’ teams at one time or another. 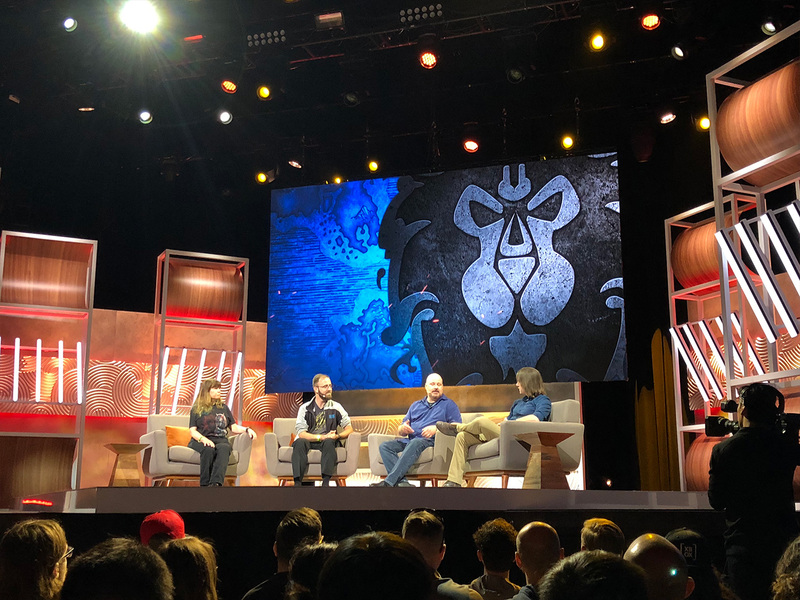 Moderator: I would say I have met a number of people from different facets of the company on low-level development to upper-tier development, and there was a very good sense of collaboration at Blizzard that kind of make me feel good about the properties. 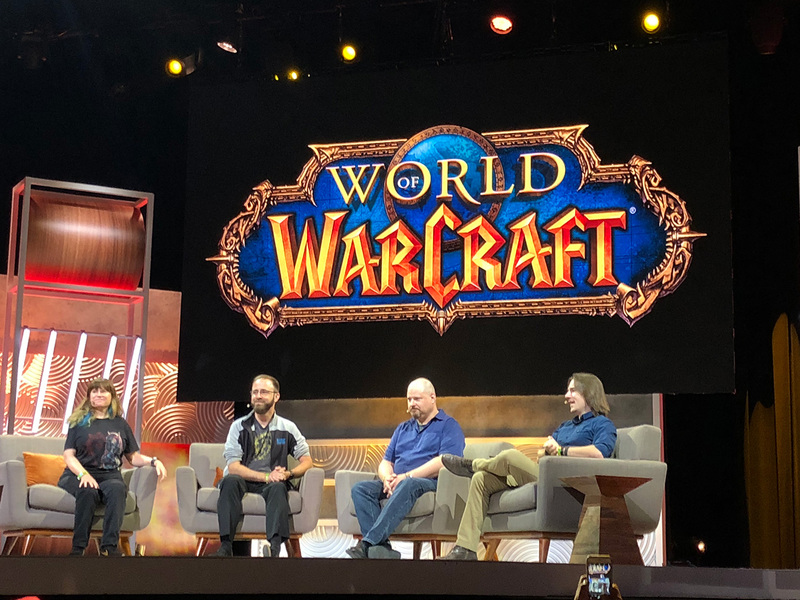 I mean, the reason I am here is because I believe in what you guys do and have, since I was very young… when that the first Warcraft came out, and Diablo, so keep that up. That’s what I am saying. (laughs) You guys do a good job of building that atmosphere. That kind of creative collaboration. Terran: And we’re two months out from launch for Battle for Azeroth. Some of you may have seen that we’ve released a couple of comics so far. Some of them written or co-written by Christie and Steve — who was involved in the “Three Sisters” Comic. There is more content that will be coming out soon that will ramp-up to the launch. Some it we have not talked about yet, but it’s really exciting. There are some surprises waiting for you. Steve: What surprises would those be, Terran? Terran: During now and launch day. Terran: (Laughs) Some stuff that we’ve never tried before. So it’s really really exciting. Moderator: Speaking of launch day, you guys are launching August 13th at 3:00pm pacific worldwide. Is that correct? Steve: Simultaneous worldwide launch. First time we’ve ever done that. All regions get to play at the same time. We have just amazing engineers who are just as passionate as all the rest of our team, and they take a lot of pride in being able to do this for our players rather than have some people being able to log in and other people waiting… hit the ground running, Everybody in there. The whole world is going to fight for Azeroth. Moderator: I can’t be waiting for everyone to be clicking on that same spyglass in Warlords to go and start their freaking garrison. I don’t have a problem with that. Speaking of worldwide, we have our final moments here at the panel, it’s one thing to build a story with a handful of important characters to develop 5 to 10 major players in your narrative. You guys have a hundreds of important story characters that you have to develop/maintain consistency with their personality and traits… how do you do that? Steve: Yeah, it’s an embarrassment of riches to work with, honestly. We have so many characters, and different people love different characters for different reasons, so we really get to look at what’s the story we’re try to tell, what are the best characters, who would be most involved in this. Who would have the biggest stakes and we try to bring those in. So some expansions, some of our major characters might set out for a while, then they come back in. We’ve got Jaina Proudmoore who has been kind of out of the scene for while. She is front and center in this one. So that’s really exciting for them. Terran: At long last. At long last, Jaina is having her moment in the spotlight in World of Warcraft. Moderator: Thank you guys very much, can I get a quick round of applause for our fantastic panel, for Steve, Terran, and Christie. Super excited to see what comes up at the Battle for Azeroth expansion. Personally, once again, you can look forward to that release in August 13th (in just a couple of months) worldwide at 3:00pm pacific. I am Mathew Mercer. Thank you for letting me be your moderator for this panel. I hope you have a wonderful day at E3, and thank you very much.